Q: What size feeder cable and overcurrent device and overload protection and disconnect switch are required for two single phase motors, 10 hp, 230V, if the terminals are rated for 75C? 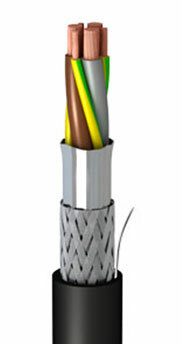 The cable shall have an ampacity of not be less than 125% of the motor's rated full load current. Then you need to derate the cable for factors like ambient temperature and number of conductors in the tray or conduit, underground installation, and voltage drop. The overload rating depends on the service factor (SF) of the motor. If the SF is 1.15 or greater, then the ampacity of the overloads is to be a maximum of 125% of the motor's rated full load current. If the SF is less than 1.15 or not marked, then use rated for a maximum of 100% full load current. If there is one feeder going out to a group of two or more motors, the cable is sized for 125% of the largest motor, plus 100% of the sum of the full load currents of the rest of the motors. The overcurrent device for this feeder will be the rating of the overcurrent device required for the largest of the motors, plus the sum of the full load current of rest of the motors. The disconnect switch would have to be rated for 115% of the rating of the largest motor plus the sum of the ratings of the rest of the motors if you want the one switch to isolate all motors. That switch would also have to have a horsepower rating of the largest motor in the group. So for the two motors which are probably rated at 50A each, you need a minimum #3 AWG (26.7 mm^2) cable. The rating of the overcurrent depends on whether you want to use circuit breakers or fuses. I would use Class J Time Delay fuses which would be have to be (50 x 1.75) + 50 = 137.5A, forcing you to go up to 140A fuses. The disconnect switch would have to have at least rated for 107.5A which will push you up using to a 200A switch, which would also, as fate would have it, have the required 50 Hp interruption rating, and be large enough to contain those 140A fuses. Article 430.32 of the NEC clearly states that overload protection for motors is based on the Service Factor and nameplate FLA only, as I stated above. If you want to guess at what the FLA of a motor is, then use efficiency and power factor. In the end, you need to use the nameplate amperage only for the overloads you actually install. As for overcurrent protection, the multiplier that is to be used is dependent on whether you use fuses or circuit breakers. I personally choose to use dual element time delay fuses for motors whenever possible. Article 430.52 of the NEC and the associated table clearly states that a 175% multiplier be applied for time delay fuses for all AC motors other than wound rotor motors. Inverse time circuit breakers get the 2.5 FLA factor.